The Panasonic PNA4602M is discontinued and is difficult to buy. Fortunately, the Vishay TSOP4038 is a compatible (if not a superior) drop-in replacement. (Update: The TSOP4038 is now replaced by TSSP4038). Both modules are three-pin through-hole components that detect continuous infrared signals modulated at 38 kilohertz. The PNA4602 was popular in robotics for obstacle detection and navigation. I’ve used it for mini-sumo (Bugdozer, Have A Nice Day, No.2) and room exploration (Roundabout). Officially, the intended purpose of the PNA4602 is as a remote control receiver demodulator (Streamhawk, Jet). In fact, I relied on that sensor so much that I was despondent when I discovered the PNA4602M was listed as obsolete. At first, it seems like there are lots of comparable sensors that can be substituted, but it turns out they only accept bursts of signals instead of a constant 38 kHz emission. This is acceptable to many electronic projects controlled by a microcontroller, as they can turn on the signal, read the detector output, and then turn off the signal. Unfortunately, simpler circuits with a 7400 NAND oscillator or 555 oscillator are difficult to add intelligent quiet periods to. Thus, most infrared detector modules are incompatible for continuous object detection. Fortunately, you can swap the TSOP4038 for the PNA4602M in almost all situations. The Vishay TSOP4038 can be purchased at Mouser Electronics (782-TSOP4038 $0.70). 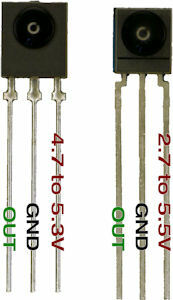 Both infrared detector modules have a similar package, with the TSOP4038 case being 33% smaller. The Panasonic PNA4602M has a reception half-angle (50%) of about 37 degrees, compared to 45 degrees for the Vishay TSOP4038. This might be a substitution incompatibility for projects with a narrow opening or detection corridor. Based on my experiments, the TSOP4038 has a better detection range, which is usually beneficial. If this causes you an issue, simply decrease your infrared emitter output. The PNA4602M outputs a 100% solid high signal for a 6×6-inch ABS white target 33 centimeters away, whereas the TSOP4038 did so up to 47 centimeters away. The PNA4602M output dropped to below 1% at 42 cm; the TSOP4038 at 63 cm. The length of the drop is almost twice as long for the TSOP4038, but almost the same ratio as the PNA4602 (+27% vs +34%) of drop period / full detect period. Because the outputs are the same value (100% on) for various distances (10 cm, 20, cm, 30 cm, etc), these sensors are unsuitable for measuring distances. During normal operating conditions, you'll need to come up with a circuit or algorithm that can handle the fluctuating region from 99% to 1%. As it turns out, there are a few other details about the output that is worth understanding. See the next page. Aside: For this article, I also tested the Vishay TSOP58038. It is an infrared detector with very similar specifications to the TSOP4038. For some unknown reason, none of the parts I tested seemed to work. They gave seemingly random output regardless of the target distance when a 38 kHz wave was being emitted. So, I can’t recommend the TSOP58038 at this time.